I am popping in to share a card I made for the current and almost closing MFT Sketch Challenge #351. The colours I used were inspired by the MFT Colour Challenge #77. I started with creating the background. I blue heat embossed the Whimsical waves BG stamp on Bristol Smooth cardstock and applied Broken Chin distress ink over it. I added water droplets and sprinkled some diluted Blueprint Sketch and Broken China distress inks all over. I Die cut it with a rounded rectangle die from a Blueprint set. I also created the sand from light grey cardstock using the same rounded rectangle die and a stitched scalloped border die. I sprinkled it with some diluted grey tone distress inks. The images are stamped from the Mermazing and Beast friends stamp sets, coloured with Copics. I added some details with a black glaze pen and white gel pen, some shimmer with Spectrum Noir shimmer pen and glossy accent on some parts after die cutting them with the coordinating dies. I popped up the images with 3D foam tape for more dimension. The sentiment I stamped on a piece of light grey cardstock and cut a speech bubble into my background to make it visible. It all got a silver metallic mat and I embellished the scene with some clear droplets from Studio Katia. I will link this up to the Simon Says Stamp Wednesday Challenge Pop it up also. I hope you like it and will return soon for more inspiration. 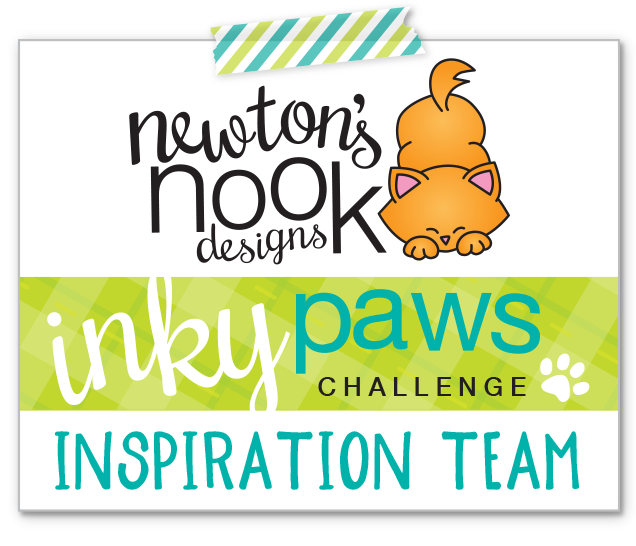 It is Monday and a starting day of a new Inky Paws Challenge #56. This time it is all about fun Halloween colours. I had a mini stamp set called Newton’s Perfect Pumpkin and I was longing to use it. 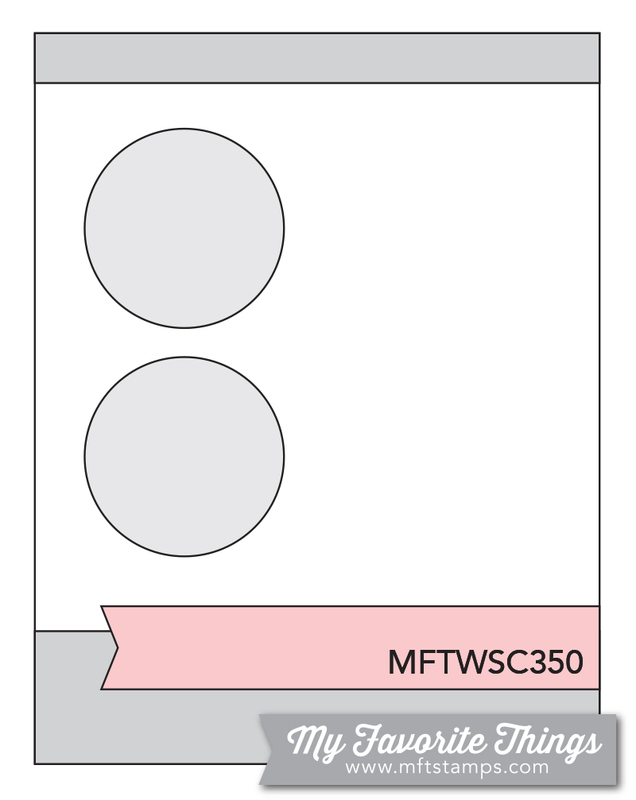 Whenever I want a quick card and I have a bit smaller image, I like to go for a tag on a card design. I had a gorgeous silver foiled patterned paper from Doodlebug, which was perfect as a background and I die cut 3 stitched striped from purple metallic cardstock to make it more interesting. I mounted the tag with 3D foam tape and added some details with a black glaze pen, some clear shimmer (Spectrum Noir pen) and a bit of glossy accents. I hardly ever make a card without those little accents, I believe they make any card look so much better and special. That is it from me for today, I hope you got inspired and will create a project for this fun challenge. You have 2 weeks to play along and who knows, maybe you will be the random winner of the 20$ gift certificate to the NND store. I will link this project to the Simon Says Stamp Monday Challenge Shimmer and shine and the Wednesday Challenge Pop it up. There is still one category left from the MFT Card Design Superstar Contest: the Innovation master. Here is my card, trying to show all the effects on pics. This category was the most difficult for me as I wanted to combine different techniques in one card and I admit it took a while. I have never made anything like this before and it was so nice to challenge myself. I almost gave up and then I said I could do it and I did. Knowing that this was the first “oh-so-complicated” card I made I am happy with the result. I used a ton of different stamp sets and a lot of MFT dies. Instead of the process, I will rather share the interactive part. The window is a see through shaker filled with mini stars, snowflake sequins and glitter. And the biggest innovation for me at least is the light-up fireplace. It looks exactly how I imagined and I am so proud of myself that I could make it 😀 First time ever to try the Chibitronics starter kit. As the fireplace is really dimensional, the card has depth which I solved with an extra scoring. It is a bit shorter than a usual A2 card because of this. All the imaged are coloured with Copics and embellished with Spectrum Noir shimmer pen, black glaze pen, white gel pen and some glossy accents. Have a wonderful evening and thanks for stopping by. This will be a different post than usual, as I just realized that the MFT Card Design Superstar contest is ending in 6hrs. I did not want to miss the deadline, so I am sharing my card for the Colouring Virtuoso category. I wanted a dreamy scene and when I flipped through my MFT stamps I realised that the Beach Bunny set perfectly coordinates with the Snuggle friends and Somebunny I love sets. So I stamped and coloured several images from these using Copic markers. I used the coordinating dies to cut them out. For the night scene I used Black Soot and Blueprint sketch distress inks and a heat embossed sentiment along with some tiny stars too. The grass is cut with MFT die too. 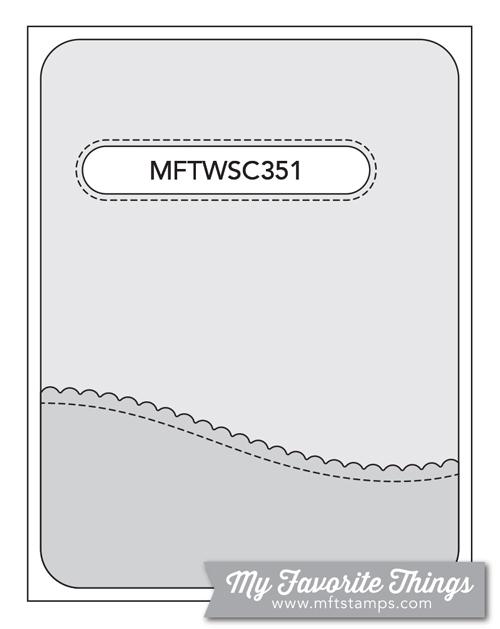 The dream part is stencilled (Mini Cloud stencil) and die cut with a Scalloped stitched border die. Images are popped up with 3D foam squares. As I always do, I added some more details with a back glaze pen, a white gel pen, Spectrum Noir Shimmer pen and some glossy accents. The only embellishment added are the little heart gem stones. I hope you like my card and will check the interactive one too in my next post. For my card I used the NND Apple Delights mini set, stamped the image on Copic friendly cardstock and colour with Copics. I die cut the panel with a dotted rectangle, gave it a golden mat. I also gold heat embossed the sentiment on green cardstock, cut a banner out of it and matted a smaller banner under from brown cardstock. For the background I used patterned paper meant for origami (from my local discount shop), I felt it matched the theme so well. I gave it a stitched scalloped edge mat and adhered it to a kraft card front. I used 3D foam tape to mount the focal panel on the background and added glossy accent to the rim of the mug and the apple (2 layers for more dimension). I will also link this project up on the Simon Says Stamp Monday Challenge Shimmer and Shine. 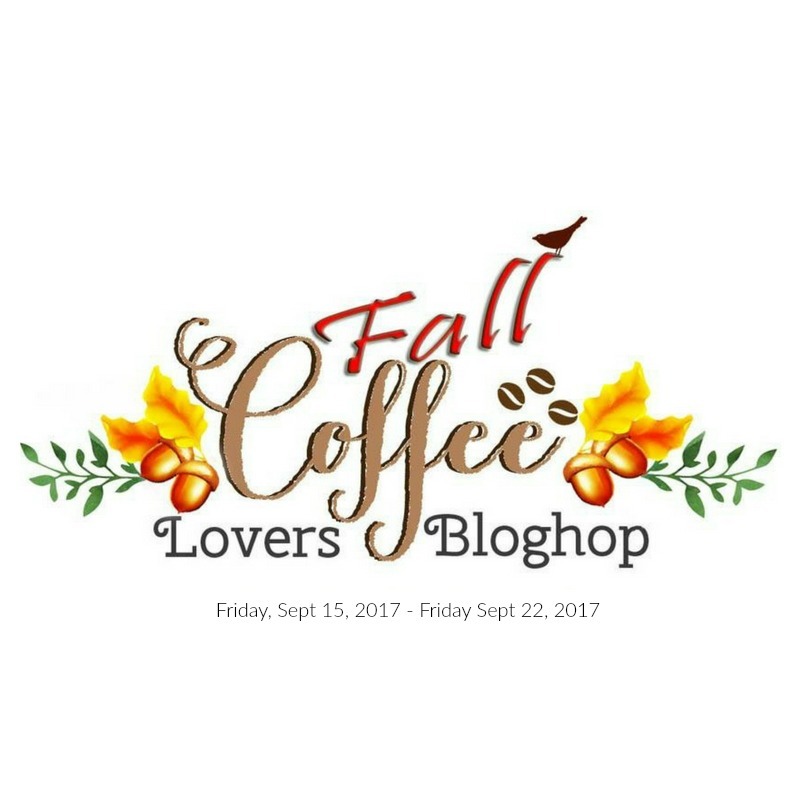 I hope you like this fall-themed card and will check back again soon. I started with selecting patterned paper, cutting it to the right size, matting it with a contrasting colour. I wanted something really fall like, I enjoy these colours so much. I coloured the images with Copics, added some details with Spectrum Noir Shimmer pen, a black glaze pen and some glossy accents. While it was drying I gold eat embossed the sentiment on an aqua coloured banner. I used 3D foam tape while mounting the circles and the banner on the background. At last I embellished the card with a few enamel dots in matching colours. I will link this project up on the MFT Sketch Challenge #350 and also on the Simon Says Stamp Monday Challenge Shimmer and shine. Hope you like my card and will pop in again soon. I started with stamping the cute snowmen couple from the NND Frozen friends set on Copic friendly cardstock. I also stamped the sentiment under them an added the little hearts above them. I used an MFT zig-zag circle die to cut my focal panel and coloured them with Copics. I had to add some shimmer (Spectrum Noir shimmer pen) and glossy accents on the scarves, noses and hearts. I also used a black glaze pen on the buttons. After that I worked on the background pieces: I die cut a zig-zag stitched rectangle from light blue cardstock and using the Starfield stencil I applied white texture paste with a spatula. I carefully removed the stencil, sprinkled Judikins iridescent embossing powder on top of the stars/ snowflakes and set it aside to dry. I heated it with my heat tool only after an hour or so, to melt the powder. In this way it did not puff. I also cut a piece of snowflake patterned paper to cover an entire card front, a wide strip of silver glitter cardstock and 2 little banners from dark green cardstock for contrast. When assembling the card I used a thin 3D foam tape under the focal panel to balance the dimensions. I hope you like my card and will play along with us on the IPC Challenge. You have until this Friday to upload your creation and have a chance to win a 20USD gift certificate to the NND online store. I will also upload this card to the Simon Says Stamp Monday Challenge It’s written in the stars (because of the stencil). Thanks for stopping by and see you soon with another card project.